Just a stroll along the main shopping streets and the market area is enough to confirm for the curious that Kangding 康定 (དར་རྩེ་མདོ། Dartsendo) is still very much a frontier town. It seems like you can buy almost anything here: Electronic goods, clothes, food, pharmaceuticals, hardware and building supplies. Souvenirs are not hard to come by either. There are several shops dealing in Tibetan antiques and curios, everything from cheap tourist trinkets to genuine works of art. I perused a few of these shops and bought several strings of prayer beads before I came across the shop that really grabbed my interest. Now, to be sure, I am no expert on Tibetan Buddhism or Buddhist iconography in general, but I suspect that some of this blog’s regular readers might be – so I’d very much appreciate any comments, corrections, or clarifications which my speculations here might merit! … My best guesses are that these thangka might depict: a) Red Tara, b) Hayagriva, and, c) Green Tara (?). Each scroll measures roughly 35cms / 13¾ inches height, 27cms / 10½ inches max. width, with the image being similar in size to a postcard, roughly 15cms / 6 inches height, 10cms / 4 inches width. I also bought two brass butter lamps (roughly 7cms / 2¾ inches max. diameter; 10cms / 4 inches height, each very simply turned on a metalworking lathe). Such butter lamps are an important part of day-to-day Tibetan Buddhism as well as its various festivals, and they can be found in all Buddhist temples. The light of these lamps is akin to the spiritually transformative process sought by Buddhists seeking enlightenment, symbolised by the physical illumination of a flame arising out of an otherwise ordinary ‘everyday’ substance such as yak butter. In Louis King’s time there would have been many of these devotional butter lamps burning inside the temples, indeed there is a sublime but very small and difficult to make-out photograph taken by Louis himself inside what I suspect might be Dorje Drak (Jingang Si) which seems to show banks of butter lamps burning beneath a large thangka painting which is partly obscured by a shaft of strong sunlight entering the temple, with what looks like a row of seated statues high in the roof beams overhead. Nowadays these butter lamps are more commonly found inside special cabinets standing outside in the temple courtyards, this is presumably done as a safety precaution against fire – although as a recent fire at Lithang late last year has heartbreakingly demonstrated ordinary electrical accidents can be just as devastating. These photographs are of the butter lamp cabinet found in the courtyard of Lhamotse Gompa (Nanwu Si). 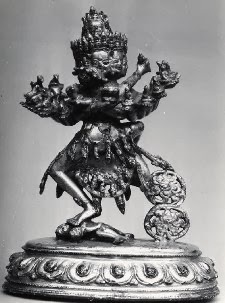 During his first stay at Tachienlu (Kangding / Dartsendo) Louis Magrath King collected a number of religious objects, including some thangka paintings, prayer wheels, a dagger, and a number of vajra, as well as several small statues – such as this wonderful 17thcentury Hevajra with his consort. He donated these objects to the British Museum, presumably when he passed through London on his way to or from serving in France as a Captain assigned to the Chinese Labour Corps around 1918-1919. I’ve not been able to trace any archived correspondence at the British Museum relating to Louis’s donation, but amongst Louis’s own papers he did keep hold of an official letter of thanks from the then Director and Principal Librarian, Sir Frederic Kenyon (1863-1952), whom it’s not clear (but perhaps unlikely) that Louis met; as well as a ‘Deposit Receipt’ for the five thangka paintings he donated which was signed by Laurence Binyon (1869-1943), who was then Deputy Keeper of Oriental Prints and Drawings and a well-known poet, now best remembered for his poems on the Great War. Given Louis’s own literary ambitions it's interesting to think of these two men meeting in this way. Several of the statues which Louis gave to the British Museum are of such quality that they remain on permanent display in the British Museum’s Asia Gallery (Room 33). During his second stay at Tachienlu after the First World War Louis was given a remarkable object by the Kalon Lama, Champa or Jamba Tendar (c.1870-1922), who was a senior state official and Governor-General of the Tibetan province of Kham (note: the link above is to a French Wikipedia entry for Champa Tendar; there is a biographical entry for Champa Tendar in English here on The Tibet Album, but be aware all the photos this entry currently links to are actually of the subsequent Kalon Lama who succeeded Champa Tendar after he passed away in 1922). Louis and Champa Tendar seem to have got along very well with one another, and Louis gives his own account of the Kalon Lama’s life in his book, China in Turmoil (1927). The object which was given as a personal gift from the Kalon Lama to Louis as a mark of their personal friendship was a silver teapot which was said ‘to have been in use by the 11thDalai Lama.’ Louis duly reported the gift to his superiors in the Consular Service and the Foreign Office and was subsequently given permission to retain the gift for himself. I don’t know where the teapot is now, but I know for certain that Louis did not donate it to the British Museum even though there are similar teapots in the BM’s collection donated by some of Louis’s contemporaries, notably Sir Charles Bell (1870-1945). Many such objects acquired during traveller’s journeys have found their way into various museum collections throughout the world. It was Louis’s small but significant collection which started me off on this long and continuing journey of research when I was first asked to write about him for the British Museum Magazine. I’ve always been fascinated by these often rather anecdotal stories connected to objects. We can learn a lot about cultures and technologies in different time periods from such artefacts, but it’s also these side stories which can tell us as much about how such objects have been perceived and used in later eras. Sometimes these stories in themselves can make what might otherwise be relatively ordinary or mundane ‘everyday objects’ uniquely special in their own right. I recall once whilst noseying around in a museum store room I came across one such extraordinary-ordinaryobject. It was a small prehistoric flint arrowhead, much like any other prehistoric flint arrowhead – there are hundreds upon thousands of these in museum collections everywhere – but this one was accompanied in its drawer by a neat little handwritten note which said that this particular arrowhead had apparently been discovered by woodman whilst he was felling a tree, the arrowhead presumably having embedded itself in the tree trunk which (if true) had continued to grow around it. Such anecdotal side stories are often as (or even more) fragile than the actual objects they accompany - for instance, how might we perceive that little arrowhead without its accompanying note? ... This is one of the key reasons why museums as repositories of such folk knowledge, as much as the actual artefacts themselves, are such important cornerstones upon which our human history sits, in which our history can be preserved and shared across time. Every object, whether it is old or new, whether it is a priceless work of art or an ordinary, common everyday utensil, has its own significance and its own unique story to tell.